Requirements were NEW effective September 7, 2011. Demonstrate scorekeeping using the algebraic system of chess notation. Discuss the differences between the opening, the middle game, and the endgame. Explain the four rules for castling. On a chessboard, demonstrate a "scholar's mate" and a "fool's mate." Demonstrate on a chessboard four ways a chess game can end in a draw. Explain four of the following elements of chess strategy: exploiting weaknesses, force, king safety, pawn structure, space, tempo, time. Explain any five of these chess tactics: clearance sacrifice, decoy, discovered attack, double attack, fork, interposing, overloading, overprotecting, pin, remove the defender, skewer, zwischenzug. Set up a chessboard with the white king on e1, the white rooks on a1 and h1, and the black king on e5. With White to move first, demonstrate how to force checkmate on the black king. Set up and solve five direct-mate problems provided by your merit badge counselor. 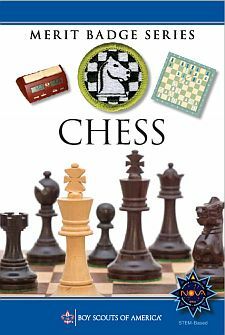 Play at least three games of chess with other Scouts and/or your merit badge counselor. Replay the games from your score sheets and discuss with your counselor how you might have played each game differently. Play in a scholastic (youth) chess tournament and use your score sheets from that tournament to replay your games with your merit badge counselor. Discuss with your counselor how you might have played each game differently. Organize and run a chess tournament with at least four players, plus you. Have each competitor play at least two games.